Below you will find details on some of our recent custom electronic projects. 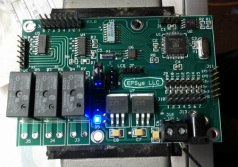 The latest Bell Controller is based on the Parallax Propeller microcontroller. This chip provides 8 cogs that can simultaneously process multiple tasks. This updated version of the controller provides a cleaner user interface, more accurate clock, and some additional features. I will also be making this board available to the public as it can be used to control items other than church bell tower bells. The board provides three multipurpose normally open relay contacts that can be controlled directly from the controller. It also provides for the expansion of 4 additional relays. There are headers for an LCD, GPS, and both matrix and individual style button inputs. A header provides direct access to 2 completely open control pins and to 7 control pins that can be used for LEDs or other IO. This board will be available for purchase shortly. Please use the contact link to request more information. This control system was designed from the ground up to replace an aging mechanical bell ringer controller. The Bell Controller allows automatic tolling of the bells at predetermined times. It also allows manual tolling or pealing of the bells. It features a key lock, display, and multiple input buttons. It also includes a real time clock and automatic daylight savings time adjustments. This particular controller is currently installed in the bell tower of St Paul Lutheran Church in Millington, Michigan. The processor used in this controller is the Javelin Stamp by Parallax, a micro-controller that runs a subset of the Java language. It is interfaced with a real time clock, LCD, and the input buttons. Control of the bell hammers is maintained by external solid state relays. The Javelin Stamp is no longer produced, but limited quantities still remain. This project is currently under development. It will allow remote control of a projection system, including communication with the projector and remote screen operation. This system will also include express functions that can make complex task sequences like lowering the screen, turning on the projector, and selecting the correct input as simple as a single button press. Gamma - A mobile robotics investigation platform. RGB LED - A multicolor LED controller. Since we focus on custom electronics, very few things are outside our scope of design capabilities. If your project is big or small, let us know and we will be happy to discuss the project with you. Use the contact page to get started.